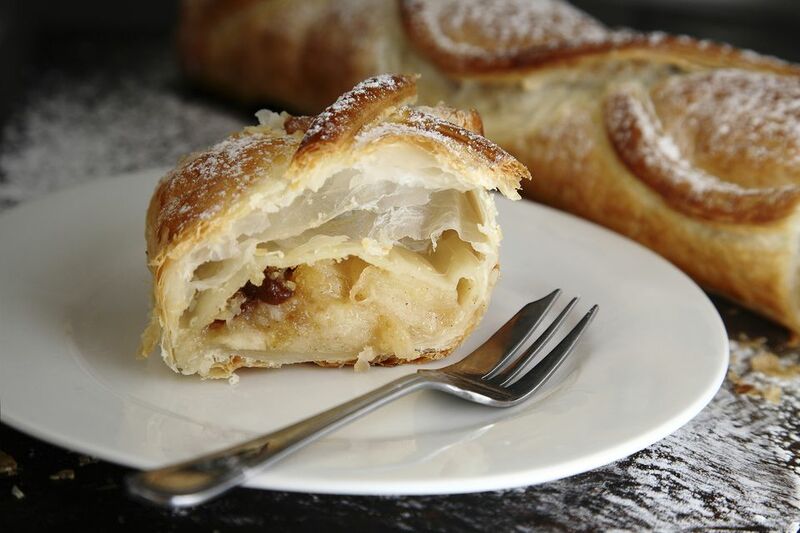 This recipe for apple walnut strudel looks impressive but it's not nearly as complicated to make as it seems. It makes use of packaged ingredients like puff pastry and pie filling so you can easily keep the ingredients on hand for last-minute brunch guests, an impromptu afternoon tea, or a quick gift to take to a friend or neighbor. Preheat the oven to 400 F. Line a baking sheet with parchment paper. In a bowl, stir together the pecans and the apple pie filling. In another bowl, stir together the brown sugar, flour, and cinnamon. Set both mixtures aside. On a work surface dusted with flour, carefully unfold the puff pastry. With a rolling pin, roll out the pastry to form a rectangle about 12 inches long and 9 inches wide, being careful that the pastry doesn't stick to the surface. Visualize the pastry divided into thirds like the creases of a letter that's been folded. Using a knife or a pastry cutter, cut slits along the long sides of the pastry, extending from the edge of the pastry to the edge of the middle third, leaving the middle uncut. The slits should be 1 inch apart. Spread the apple-nut mixture along the length of the middle third of the dough, leaving about a half-inch on either end. Sprinkle the brown sugar mixture over the filling. Beginning with one short end, form the braid: Fold the half-inch edge of dough over the filling. Then fold the first strip on the right over the filling at a slight angle. Fold the first strip on the left over the filling, overlapping the first strip. Continue folding strips of dough from alternate sides to form a braided pattern. When you get to the top, fold the edge of the dough over the filling, tucking it under the braided strips. Using two spatulas, carefully transfer the braid to a parchment-covered baking sheet. With a pastry brush, lightly brush the egg mixture over the braid. Sprinkle with sugar. Bake at 400 F until the pastry is golden brown, about 15 to 20 minutes. Let cool for 15 to 20 minutes before slicing into 8 pieces. Serve warm or at room temperature.